News about Secular Coalition for Arizona in the media. Follow this link to watch Robert Peoples of the Affinis Humanity Coalition deliver a moving secular invocation before the AZ State Senate as a guest of Sen. Andrea Dalessandro and Secular AZ. Give yourselves a hand, Secular Supporters! You spoke out en masse, and your voices were heard. Superintendent of Public Instruction Diane Douglas is attempting to limit the use of the word “evolution” in Arizona high schools' science curriculum, in spite of more than a year of work by 100 educators, parents and community members who drafted new science education standards. The Secular Coalition for Arizona strongly opposes this attempt to supplant fact-based learning with religious dogma. Many agree, including Reverend David Felten of The Fountains United Methodist Church in Fountain Hills. The AZ House voted to allow the phrase "God Enriches" - an English translation of the state motto that references the Biblical book of Genesis - to be posted in Arizona's public schools. Do We Need (Yet Another) Religious Endorsement in AZ Public Schools? 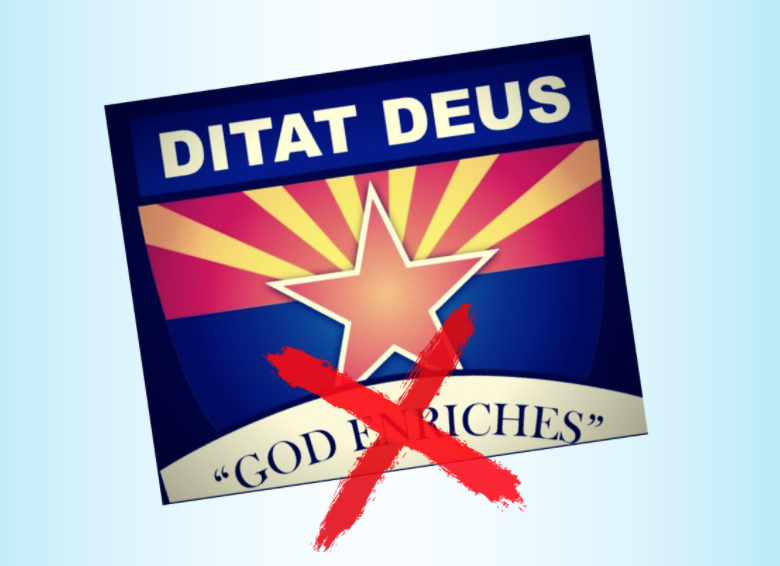 The Friendly Atheist can't understand why the AZ Senate passed SB1289, allowing teachers and administrators to post a translation of the AZ state motto, Ditat Deus, in classrooms.... and Secular AZ agrees. Read more about Do We Need (Yet Another) Religious Endorsement in AZ Public Schools? Secular AZ Board member and attorney Dianne Post joined concerned Fountain Hills residents to bring attention to the town's improper and unconstitutional use of taxpaper money to promote a religious event. At a June 1 Town Council meeting, FH resident Susan Fallon objected to Mayor Linda Kavanaugh's proclamation supporting a "National Day of Prayer" event, noting that the Mayor's endoresement and the town's use of taxpayer dollars to support the prayer event represent an unconsitutional endorsement of religion. Phoenix New Times: Whose Higher Power? The Phoenix New Times published an article on Republican House members' overreach after Rep. Athena Salman offered a secular invocation on the House Floor earlier this week. As Salman noted, "The Arizona House of Representatives is the people's house," she said, her voice cracking. "Opening prayers in the House should represent Arizonans of every faith's perspective. This includes the hundreds of thousands of Arizonans who, like myself, who do not believe in a supernatural god, but do believe in the power of humanity to do good in the world." Read more about Phoenix New Times: Whose Higher Power? Religious Preference in the House: Rep. Salman and Secular AZ in "The Nation"
Secular Coalition for Arizona was featured in The Nation magazine this week. The article — entitled An Arizona Legislator Gave an Invocation that Didn't Mention God. You Won't Believe What Happened Next — detailed the controversy that erupted after Representative Athena Salman offered an invocation that didn't mention a "higher power" on the House floor this week. Read more about Religious Preference in the House: Rep. Salman and Secular AZ in "The Nation"